Swedish banks leaving Estonia like Danske and Nordea did would be rather uncomfortable from a national security perspective, Kilvar Kessler, head of the Estonian Financial Supervision Authority, told the Financial Times, referred LETA. "If you think that somebody in the headquarters of the large Swedish banks would think their Baltic banks are more of a liability than an asset, it's rather uncomfortable for me. You don't know who would replace them," Kessler said. The Financial Times pointed out that the Baltics are almost completely dependent on Swedish banks for their local banking. Swedbank and SEB -- the two biggest banks in the Baltics and both Stockholm-based -- have market shares of more than 50% in Estonia and Lithuania and 42% in Latvia, based on assets or deposits. It said that when counting in Luminor -- a joint venture between Finland's Nordea and Norway's DNB that is set to have US private equity group Blackstone as an owner -- foreign banks control four-fifths of the market in Estonia and Latvia and two-thirds in Lithuania. The worry is that shareholders might send an implicit message to the banks to get out. Danske's shares halved last year as it confessed to a 200-billion-euro money laundering scandal and criminal investigations in the US, Denmark and Estonia. 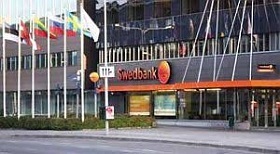 This year, Swedbank’s shares plunged by a fifth in one week on money laundering allegations. "Investors are quite shaky. Share prices are going down and this in turn has the effect that this Baltic region is seen as not so nice and maybe not an asset but a liability," said Kessler. Kessler also said that earlier, the Estonian regulator had only 7% of its staff in anti-money laundering activities. "To be frank, in Estonia anti-money laundering experts don't grow on trees," he said, adding that more people need to be trained. Penalty levels are also an issue. Until recently, Estonia's maximum fine for money laundering was 32,000 euros -- a level Kessler called "crap" and "peanuts for a bank."